Today, while thinking of something to do with the blog (and this is one of the best things about having a blog and trying to update it every day – it forces your brain to be productive) I was struck with the idea of evolving fantasy monsters. I mean, we have plenty of beast-people in fantasy games and literature – cat people, dog people, etc. But what about monster? Primates evolve into humans – what might rust monsters evolve into. Since the idea seems to fit with Pars Fortuna, here are a couple such races designed for that game. The ustte are humanoid insects that stand about 4 to 5 feet tall. They have hard, chitinous skin of steel gray, smallish, roundish heads that bear two glossy, black eyes and long, feather-like antennae, wide, slit mouths with long, red tongues (for lapping up corroded metal) and six limbs – two legs, two large arms (like a humans arms) and two smaller, vestigial arms below them. From their abdomen they have long tails that end in “propeller” shaped protrusions. The ustte dwell wherever there is iron to mine, for though they can corrode most metals and live off of them, iron is their preferred diet. Families consist of a male and multiple females (the species produces roughly three females to one male). Each female is capable of producing a single brood. Broods always consist of four children. These children are given the same name and live with one another as a unit until young adulthood, when they might join with other ustte to form a new family. Ustte lairs are usually subterranean, though close to the surface. Ustte respect strong physiques and sharp, insightful minds. They compete constantly – in athletic games, tests of skill and craftsmanship and in contests of poetry. Ustte literally wear their “honors on their sleeves” in the form of tracings in gold or silver ink on their chitin. Non-ustte see these fanciful shapes as tattoos, but to an ustte they are a record of their life’s accomplishments and very important. Ustte have thick carapaces that give them a natural Armor Class of 12. Their delicate antennae can detect metals, from iron and copper to gold and platinum, up to 120 feet away, assuming they can conceivably be scented. The touch of their antennae is corrosive to non-precious metals (silver, gold and platinum). Any metal object touched by these antennae (requires a melee attack) has a 1 in 6 chance of being corroded to the point of being useless. Ustte feed on iron and steel, though they can consume other corruptible metals in their place, requiring one pound of metal each day to survive. This makes copper coinage very attractive to ustte adventurers, and some carry the metal as rations. Ustte are driven to excel as warriors and artists. Their prime requisite is Charisma. 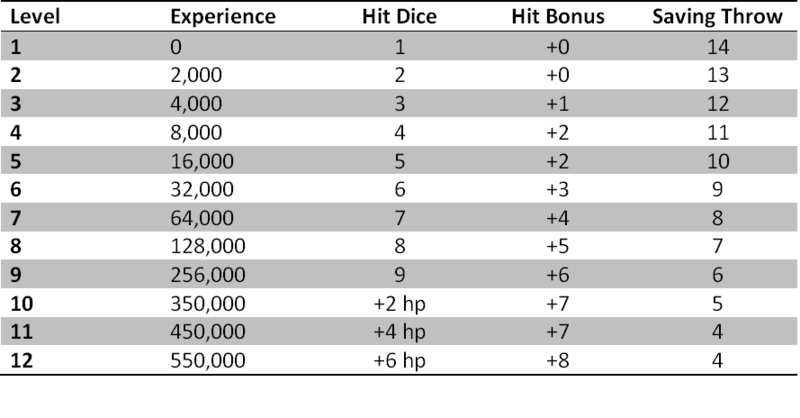 Ustte roll 1d6+2 per level for hit points (+2 per level after 9th). They can wear light and medium armor and use shields and any weapon weighing 3 pounds or less. Ustte are precise warriors, studying the fence as an art and fighting the way a sculptor sculpts. Their passion and drive give them a +2 bonus to save vs. fear effects if already engaged in combat and their ability to draw their opponent into a mistake give them a cumulative +1 bonus to hit and damage every round their foe fails to hit them in melee combat, up to a total of +5. This resets whenever the ustte scores a hit on an opponent. It is for this reason that ustte prefer not to win initiative. This bonus is lost if the ustte is aided in combat by another (i.e. another attacks the same target they are fighting). Whenever an ustte defeats a superior foe in combat, they may apply a new design to their carapace and will always compose a song in their own honor. The eaoro are a race of tall, bulky humanoids that dwell in farming villages in the midst of wooded regions. They value their privacy; the only eaoro most folk will ever meet are those who must begrudgingly leave their enclaves to trade and those who have suffered exile from their community due to sinful behavior. Eaoro are sexually dimorphic, the males being much larger than the females. Male eaoro stand about 7 to 8 feet tall, with rather short legs and long, arms. They have narrow shoulders, giving their bodies a distinct “triangular” shape, but are thickly muscled. Females are shorter, averaging 5 to 6 feet in height, and have longer legs and shorter arms. Males are hairier than females, and both sexes have heads covered with feathers rather than hair. Their skin is naturally pale, their eyes large (and telescopic) and they have black, hooked beaks in place of mouths. Eaoro are vegetarians, though certainly not pacifists. They dwell on farmsteads composed of a central longhouse constructed of stone and logs, maybe one or two outbuildings for storage and a surrounding rampart of earth and stone that stands about 5 feet high. Farmsteads support a family of a bonded male and female, their young (anywhere from three to twelve children) and maybe older relations incapable of surviving on their own. These farmsteads are situated quite near to one another. Eaoro communities are referred to as clusters and usually consist of 20 to 100 farmsteads. Somewhere in the cluster there is a hill cleared of trees that serves as the cluster’s moot. Eaoro are deeply religious, believing in litany of sins handed down to them from their forebears. When conflicts arise, eaoro must submit themselves to judgment by the moot. Sins are tallied, and judgment always goes to the less sinful eaoro. If this doesn’t cause eaoro to strive for righteousness, it certainly drives them to strive for sneakiness and to pry into the lives of their neighbors, keeping a close “sin count” in case a conflict should arise. Eaoro with too many sins to their names are usually exiled from the community. While all eaoro are taught magic from a young age, male eaoro tend to be better warriors than mages and females better mages than warriors. For this reason, each is considered separately in terms of class abilities. Eaoro are born farmers – even those who have since been cast out of eaoro society. This gives them a knack for predicting the weather and in all other matters related to the growing of crops and mending of farm implements. They also have a knack for casting cantraps. All eaoro start the game knowing three random cantraps. They can only cast them by making a spell roll and suffer the consequences of failure just like any other spell caster. Their innate strength gives eaoro males a +2 bonus to their strength score and a -2 penalty to their dexterity score at character creation. Females have a bonus and penalty of +1 / -1. These modifications cannot improve a score beyond 18 or lower it below 3. Since most eaoro adventurers are outcasts from their communities and have had to live for an extended time in the wilderness and then on the fringes of society, they have a knack for wilderness survival and pick pocketing. Female eaoro have Intelligence as their prime requisite. 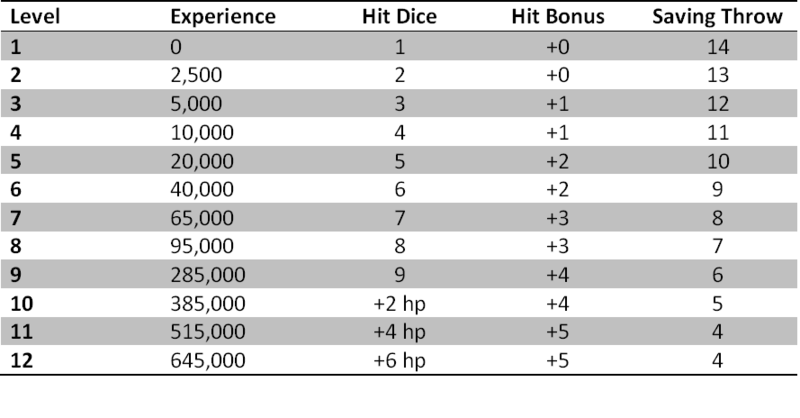 They roll 1d6+1 per level for hit points (+2 per level after 9th) and can use light armor, shields and any weapons. Female eaoro are magicians, and thus can cast magic spells. They have no particular skill at casting a certain kind of spell, being dabblers at the art. They are skilled at picking pockets, palming small objects and at bluffing. Male eaoro have Strength as their prime requisite. 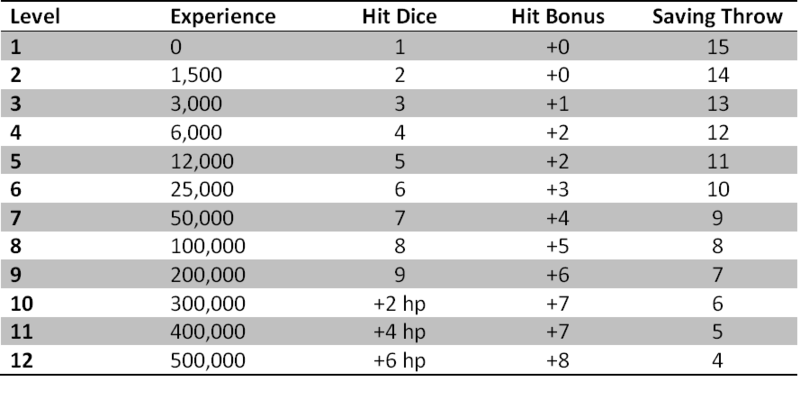 They roll 1d6+2 per level for hit points (+2 per level after 9th) and can use light armor, medium armor, shields and any weapons. Male eaoro are skilled at picking pockets, palming small objects and bluffing. They are known for their ability to present a frightening display when they enter combat, forcing all creatures with 1 hit dice or less to pass a saving throw or flee. Creatures backed into a corner or defending their loved ones will not flee.